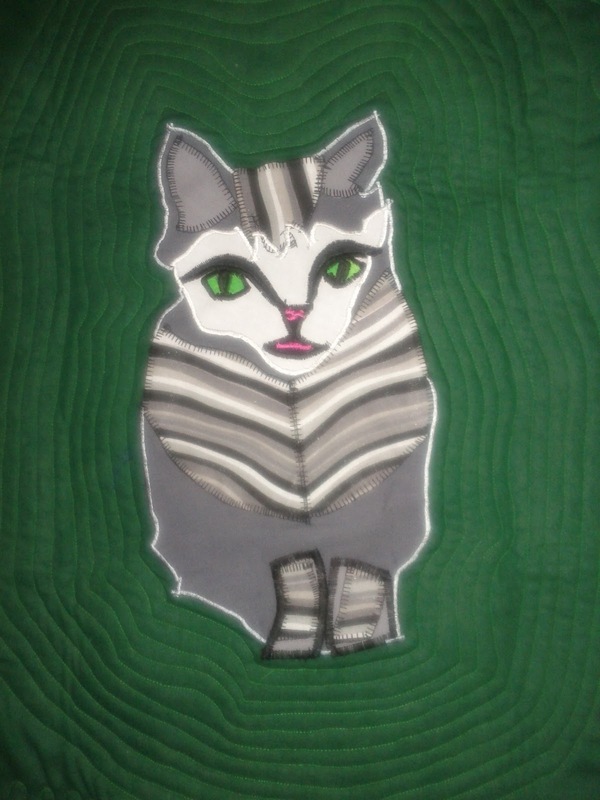 Cat Chat With Caren And Cody: My Handmade Placemat, Made by Agnes Bullock, from Dachsies With Moxie Tapestries, Quilts and More! 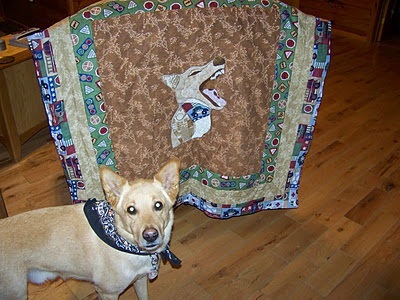 My Handmade Placemat, Made by Agnes Bullock, from Dachsies With Moxie Tapestries, Quilts and More! I was so excited about the wonderful handiwork that Agnes does that I wanted something of my own so Agnes made me this wonderful placemat! Mom neglected to take a photo of me eating out of my bowls on the placemat because she has been so busy much of a loser, but you can at least see how wonderful this is and Agnes made the kitty on the placemat so that it would look just like me! From Agnes: My name is Agnes Bullock and I have an Etsy shop called Dachsies With Moxie Tapestries, Quilts and More. I opened the shop last fall, after I began making pet portrait quilts and place mats for friends on Blogville. 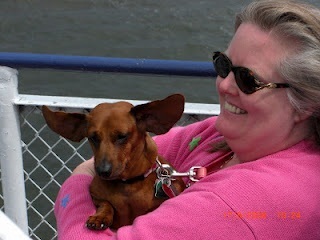 I am a novice, self-taught quilter who lives in Ohio with my husband Geoffrey and our five dachshunds, Ginger, Chip, Thai, Tasha and Anna Rose. Here are some more of Agnes' wonderful creations! Mom ordered something special from Agnes to give as a gift but you will have to wait to see that because it is a surprise! It will be featured on Dakota's blog sometime in the next month or so! It is hard for Mom and I to write this post today because right before we were supposed to write this we got an email from Agnes stating that her beloved dog, Ginger, went to the Rainbow Bridge unexpectedly. It broke our hearts to read this. Ginger hadn't been ill, she was fine. It was a most unexpected and heartbreaking loss. Please, let's show support for the Mom of one of our woofy friends and stop by her blog and extend our sympathy. We are cats, we know how to offer comfort. Cody, that is a really cool placemat. So sorry about little Ginger. What a lovely placemat that you have, Cody! Agnes is so talented and artistic! I'll pop over to have a look later! Sorry about Ginger. Hugs to her mom and family. 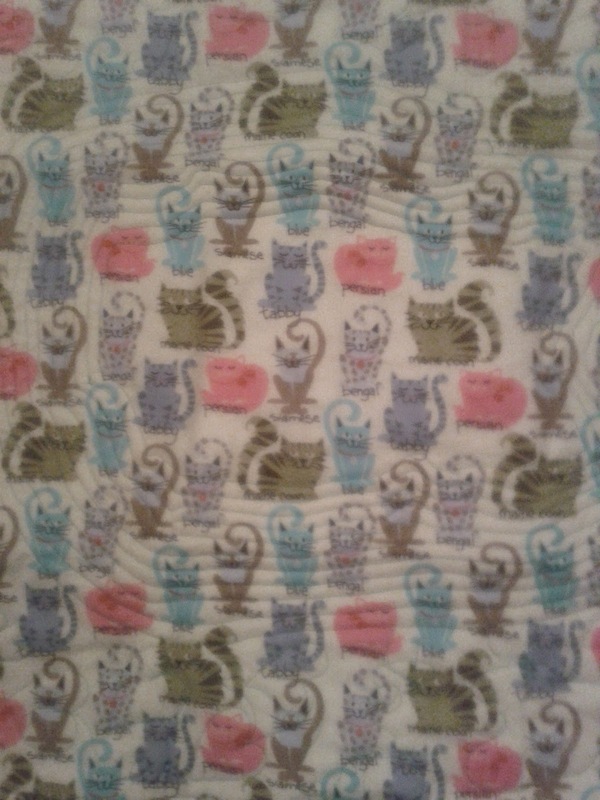 what a great place mat!SNUGGLES all round for Ginger! Whoa! That's soooo cool Cody! purrr....meow! How sad, we've gone by to pay our respects. 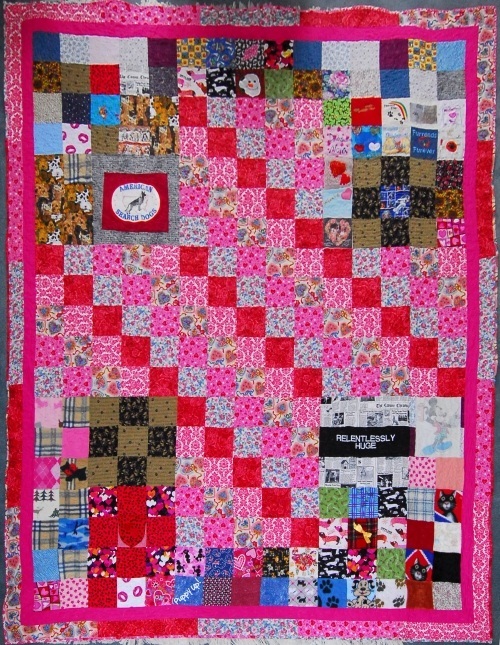 Cody we love your new placement and all of Miss Agnes's quilts! She's very talented but I know she's also very sad since her dog Ginger has gone over the Rainbow Bridge unexpectedly. We'll stop by and give her a Sammy Hug. What a great placemat! Agnes is very talented! 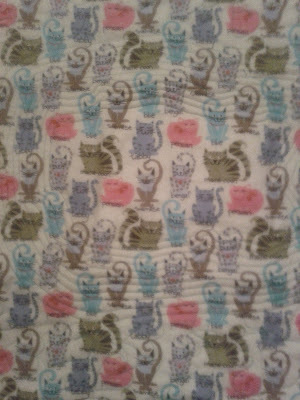 Hi Caren and Cody, we love your new placemat and we're definitely going to visit Agnes' Etsy shop!!! We were just stunned and saddened to read a the end of your post that her lovely Ginger had died unexpectedly, we're heading over to her blog right now to leave a few words. Agnes thins are so beautiful, I specially like that placemat. RIP Ginger, one day you and Agnes will be reunited. I'm glad I read to the end. It's hard to believe Agnes considers herself a novice quilter. Her work is exquisite. I will visit and give my condolences on her sudden loss. We have been over to see Agnes and left her a comment about her sweet bot. We are going to go and visit her Etsy shop too as we loved that placemat. We're so sorry about sweet Ginger. Purrs to your friend, Agnes. Her work is just beautiful!!! We love how whimsical your Cody placemat is! Gotta go check out her cool Etsy shop! The placemat is so cool! I shall stop over and visit. That is so sad about Ginger. We do like that placemat too. That lady does some good work. We will check it out. We did visit Ginger's Mom. Beautiful placemat. Am off to have a look at her work, and have visited Ginger's blog. Oh... our heart breaks at Angie's loss of her beloved Ginger. Angie is so talented - the love for animals just radiates in her work. Thank you for sharing her story and these beautiful creations with us. I send prayers for Agnes..... what beautiful things you've posted there! I love the place mat. It's so beautiful!! We are so sorry to hear the sad news about Ginger... We are sending our purrs and warm thoughts for Agnes..
We love the craftiness of this. Gorgeous! What cool things she has! The little woofie blanket is adorable. We're so sorry to hear about Ginger. We'll stop by. We're purring for all who knew her.